GREEN BAY — Randall Cobb’s status for Sunday’s season opener remains a wait-and-see proposition. “That’s the process of the week. Today will be our most extensive work of the week. A lot of things will come out of today’s practice,” Head Coach Mike McCarthy said when asked for a progress report on his star receiver’s attempt to overcome the effects of a shoulder injury. The Packers play the Bears at Soldier Field in a game usually reserved for later in the season, when the NFC North Division title might be at stake, as it was in 2013 when Cobb scored the game-winning touchdown. Is Week 1 too early in the season to play a game of this magnitude? “I think it makes for good press, but it’s also our first game. We have great respect for the history of this great rivalry. When the ball is kicked off, it’s the 2015 Packers playing the Bears. You can’t build one of these games up bigger than another. Once we cross the white line, we’re focused on defeating the other guys,” McCarthy said. A new Bears coaching staff introduces the challenge of the unknown, but the Packers have lots of experience from which they might draw in countering Bears Defensive Coordinator Vic Fangio. “I think Vic does a very good job of playing to his players. He was able to play more coverage in San Francisco. That’s a little bit of the unknown in Week 1. 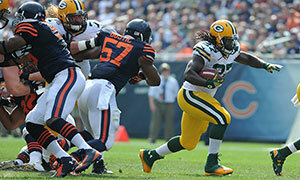 He has the ability to play coverage and is definitely creative in his pressure schemes,” McCarthy said. “Mike Pennel is looking to make the jump from year one to year two. He’s earned a starting spot, and it’s great to have B.J. (Raji) back,” McCarthy added.